On 4 June 2014 United Airlines will become the first carrier to use the £2.5bn terminal when an inbound flight from Chicago lands at 05.55. Bob Schumacher, Managing Director UK and Ireland for the airline, summed it up. “A big relief”, he said. Since the amalgamation of United and Continental Airlines the combined carrier has been working out of both T1 and T4. Mr Schumacher will even have the luxury of a large landside dedicated executive lounge, something the old arrangement denied him. It should prove a popular meeting point for BusinessFirst customers. One of the lessons learned from the less than smooth T5 introduction was that there was nothing to be gained by moving everyone on the same day. Terminal 2 will open in phases with the 26 airlines moving in over a period of six months. The new terminal produces significantly less carbon than the building it replaced. Large north-facing windows in the roof flood the building with natural light, reducing the need for artificial lighting without generating uncomfortable levels of heat in the building. Solar panels on the roof further reduce the dependency on traditional energy supplies. Additionally a new energy centre, partially fuelled by renewably sourced woodchips, provides heating and cooling for the building. The new T2 is a 20m capacity building and will be the home of Star Alliance, plus Aer Lingus, Virgin’s Little Red, and Germanwings. In fact it is two buildings, the main terminal, with 12 stands and mainly used for European flights, and satellite T2B connected to T2A via an underground walkway. Here 16 stands are provided for long haul operations, these aircraft for the most part requiring more time for the turnaround. About 10m passengers are expected to use the facility in the first year. A 1,340 space multi-storey car park has been provided and the way to the central area public transport connections should prove far less arduous than that found at the present T1. You cannot but be impressed with one’s arrival into the building. 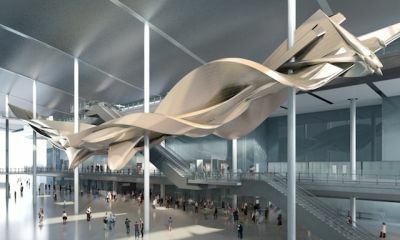 In 2010 Heathrow organised an international art competition to produce an ambitious artwork that would build on the volume and architecture of Terminal 2’s vast covered departures airside waiting area. The winner was Slipstream from British artist, Richard Wilson RA. Slipstream is a monumental sculpture that fills the entire length of this new central courtyard with a flowing, twisting and tumbling aluminium form. Wilson’s mesmerising vision was for a dynamic swirl of contours and looping metal. The sculpture is the Boeing Jumbo set inside a cavernous space on the scale of the Tate Modern’s Turbine Hall. At 70 metres long and 77 tonnes in weight, Slipstream gives Heathrow the longest permanent sculpture in Europe. Passengers arriving landside will then be faced with 60 self-service kiosks, 60 fast bag drops – which can also be configured for traditional use, 56 check-in desks (long haul clients need to be handled more delicately than those on short flights). Up to 3,000 passengers per hour will pass through 24 security lanes (17 normal, four Fastrack and three for staff and crew). 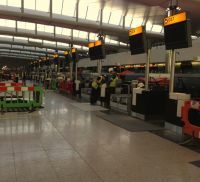 The security area is as fully automated as possible and seats are available if there has been a shoe check, and for a wait whilst a suspicious item is investigated. Provided are 52 shops and 17 bars and restaurants, including seven dining outlets with airfield views. There are no gate lounges and the old BAA yellow signage is for the most part retained. John Lewis, arguably Britain’s most successful departmental store group, will open its first ever airport outlet at T2. Costa will also be represented and has been quick to announce details of its outlet. Costing close on £1m the 3,000sq ft store is unique in the Costa estate. The counter and service points will form a central focal point and have been designed to maximise efficiency and speed of service. A dedicated iPad station will be installed for customer use to check emails, play games and browse the web ahead of their flights. For every outlet Heathrow says it received on average five proposals. An average of 55,000 passengers will arrive and depart from the Terminal daily once in full operation. The baggage system will deliver 4,000 items an hour at peak capacity. The new building is imposing. It is clear that a great deal of time and thought has gone into the design, making it both practical and eye-catching, with plenty learnt from T5. The amount of walking has been reduced too.